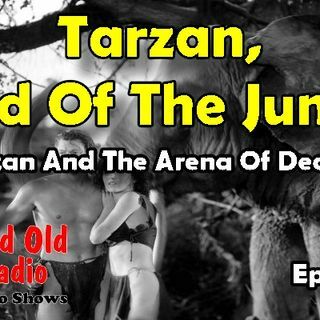 Today we feature The Tarzan, Lord Of The Jungle: Tarzan And The Arena Of Death. This channel is shared with Good Music Radio. Than 1800 Shows, Stories relate Tarzans efforts to protect his adopted homeland from evildoers. using those sounds in appropriate places in episodes. The initial radio Tarzan originated at WOR in New York City and was syndicated by the World Broadcasting System. Production later switched to Hollywood, California. The series was broadcast September 12, 1932 - March 3, 1934. Tarzan was played by James Pierce, who portrayed the title character in the film Tarzan and the Golden Lion (1927). scripts using material from the original Tarzan books, and Burroughs himself revised each script as needed for accuracy. precedent in U.S. radio. It was actually the premier feature prerecorded and distributed to local broadcasters throughout the nation and overseas. central character and premiums that could be obtained by sending in elements such as labels or box tops from the sponsors products. In the first 30 days after the Signal Tarzan Club was launched by sponsor Signal Oil, 15,000 youngsters from California signed up for it.